Location: Sunset Bay on White Rock Lake, 830 Lawther Dr. on the east side of White Rock Lake, Dallas 75218. From Buckner Blvd., take Poppy Dr. (just north of Garland Rd.) toward the lake, then left onto E. Lawther Dr. to Sunset Bay. Come on out to White Rock Lake and help Barbara Turner with her Amphibian Watch. 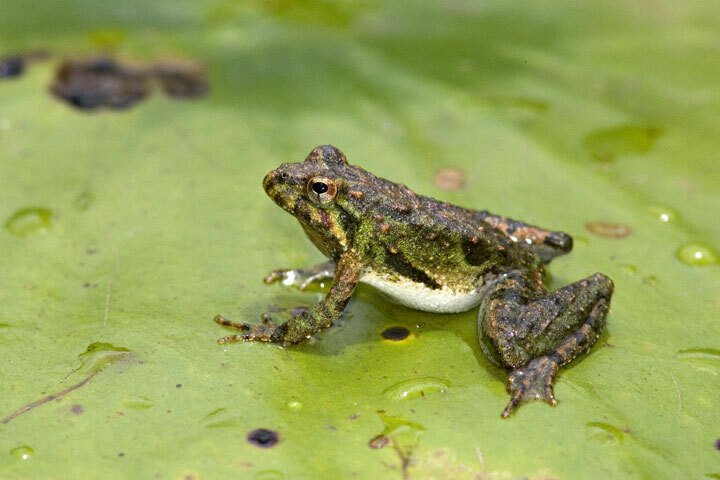 It’s an amphibian “listen,” since we ID the frogs by their croaks. Barbara sends the data to Texas Parks and Wildlife Department for their statewide amphibian monitoring efforts. We will begin at dusk (check your paper for sunset time) and will watch for about an hour and a half. Barbara will be “watching” frogs each last Friday from March through October. Come out and join the fun! (And come early if you’d like to bird watch for a few minutes.) For information, contact Barbara Turner, 972-222-7321. Bird Walk at Cedar Ridge Preserve is free and open to the public, but for adults only, please. This spring, you’ll have two chances to walk among the wildflowers at The Nature Conservancy’s Clymer Meadow. We will host an Open Preserve Day and Early Spring Tour on April 27 and our 33rd Annual Spring Wildflower Tour on May 18. Don’t miss your chance to visit this picturesque 1,400-acre preserve, which contains one of the last remnants of the Blackland Prairie – an imperiled ecosystem comprised of numerous bird, butterfly and wildflower species. 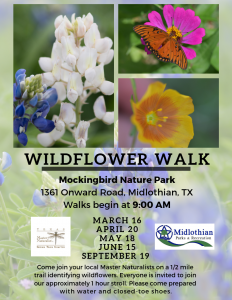 You’ll get to immerse yourself in the beauty and color of true Texas prairie while learning about the history and ecology of our native grasslands. Grab your binoculars and camera, pack a picnic lunch, and bring the whole family! RSVP to Brandon Belcher brandon.belcher@tnc.org or 903-752-0676 (c) by April 22 for the Early Spring Tour. Space is limited. Get back to nature with us! On May 18th, The Nature Conservancy’s Clymer Meadow will host its 33rd Annual Spring Wildflower Tour. Don’t miss your chance to visit this picturesque 1,400-acre preserve, which contains one of the last remnants of the Blackland Prairie – an imperiled ecosystem comprised of numerous bird, butterfly and wildflower species. You’ll get to immerse yourself in the beauty and color of true Texas prairie while learning about the history and ecology of our native grasslands. Grab your binoculars and camera, pack a picnic lunch, and bring the whole family! RSVP to brandon.belcher@tnc.org or 903-752-0676 (c) by May 13. Space is limited.